Find what your house plants needs and care are, which house plant you need. 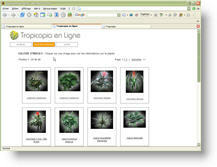 Tropicopia online is the simplified version of Tropicopia Pro - The house plant image bank for professional. All images of tropical house plants found in Tropicopia online are in the Tropicopia Pro version. Click on the link to find out more about it. Use the Latin name, English or French common names to find a house plant. 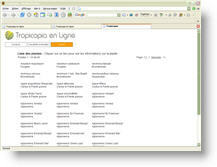 You can also use flower or foliage color as a keyword for your search. Find the house plants you are looking for using the house plant, tropical plant or indoor plant list. Tropical house plant articles. The different subjects will be about general and specific plant care, like light requirements, watering, soil, temperature, bugs and so on... just to name a few. If these subjects are of any interest to you or you have suggestions for topics just contact me so I can advise you when available.